The Frances Willard House is a National Historic Landmark (NHL). It was designated an NHL in 1965 by the National Park Service. The NHL designation is the highest historic site designation in the United States. 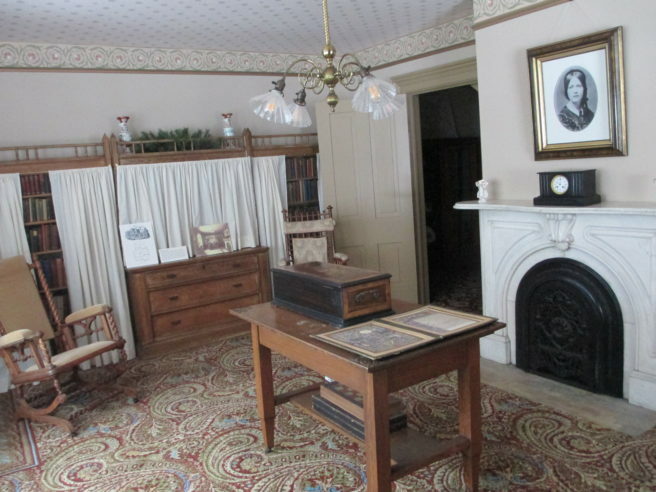 The Frances Willard House does not receive regular funding from the Park Service, but the house is eligible for special grants and technical assistance. In addition, the WCTU Administration Building was listed on the National Register of Historic Places in August of 2002. Since then, besides maintaining the exterior, interior restorations have been completed. In 2006, Willard’s Den and Bedroom were both restored to the period of the last changes wrought in the rooms by Willard, ca. 1893. Last year, we repaired the plaster ceiling in Rest Cottage’s Entry Hall; we also re-plastered and turned the Upper Sitting Room on the 2nd floor into an exhibit space. While not technically a restoration, this room was the site of the original exhibit for the Willard Museum when it opened in 1900. 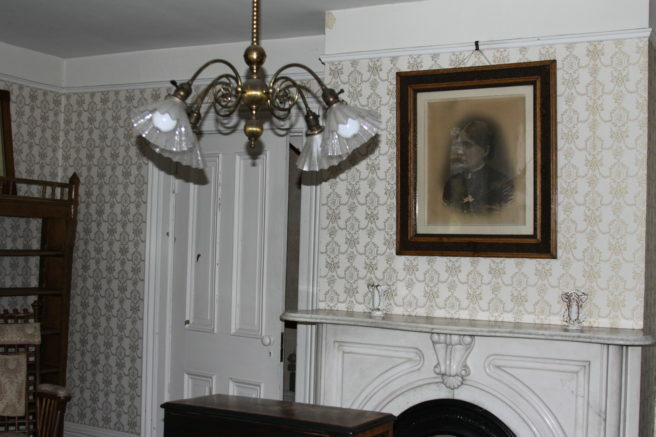 We completed a very large interior restoration project in 2015-2016 which involved restoring four of the rooms in the original Rest Cottage portion of Willard House. We gave updates during the past year on our Blog pages, so you can review many of the details while the work was being done. Here is a summary of the restoration work with before and after pictures. 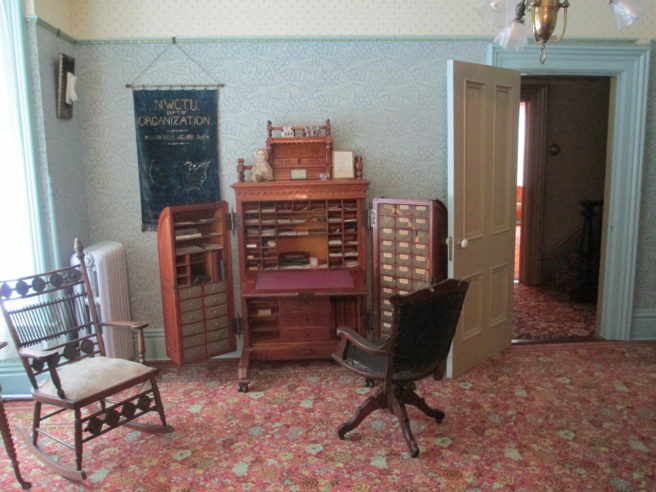 The color palette and ideas for decorating were most likely those of Mother Willard, who was still alive at that time and living in the House. Willard always insisted this was her mother’s house. All the carpets use historic patterns from the period of significance. The colors for the yarns were chosen by the restoration consultant. These are narrow-loom carpets – they are woven on period looms in England in 27” wide rolls which are then installed by cutting the rolls and stitching them together in each room. The flooring underneath is raw planking – in the 1860s when this portion of the House was built, it was cheaper to have carpets than nice hardwood floors. We could not discern the pattern for the carpet from the photo. Our carpet vendor has experts on staff who identified the paisley pattern – international influences in room decoration was in vogue at the time (India, in this case). 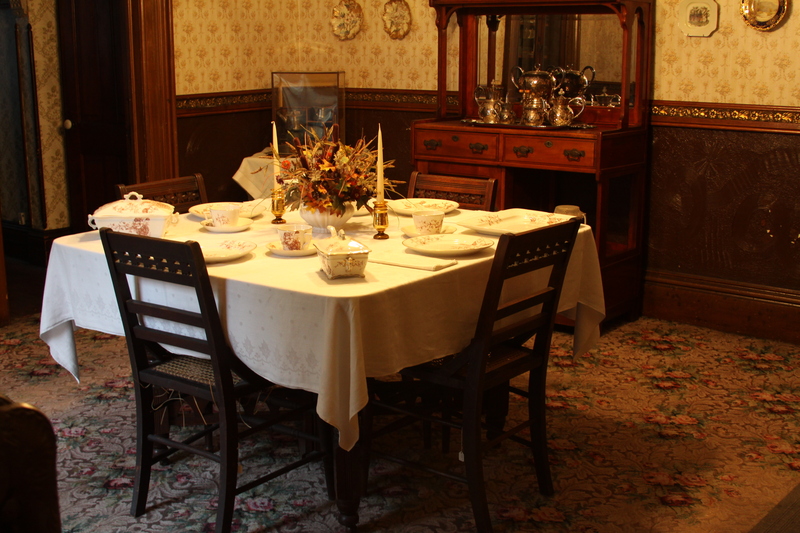 When the bay window was added during the 1890 redecorating, it promptly began sinking. It also removed 60% of a load bearing wall causing the floor in the room above to begin flexing. 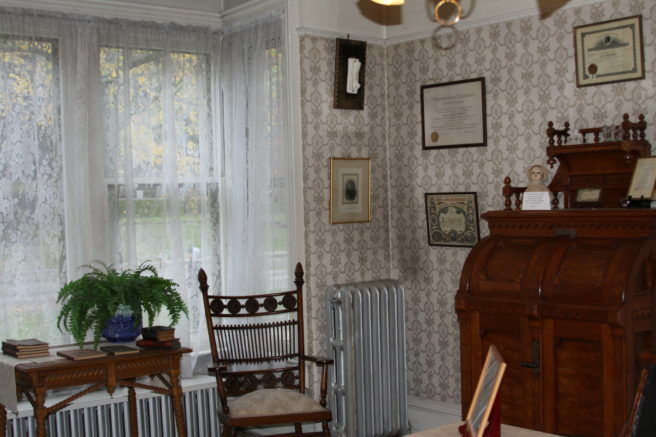 The WCTU decided to add bracing below the room by putting in joists above a drop ceiling, narrowing the frieze (area between the picture railing and the ceiling) from 18 inches to 9 inches. The frieze wallpaper evokes the pattern used then. That wallpaper was designed by Candace Wheeler, known as America’s first woman interior designer. Wheeler was the interior designer of the Woman’s Building at the Columbian Exposition in 1893. Willard was on the Board of Lady Managers for the Exposition and likely that’s how Willard and Wheeler met. When the wallpaper was stripped behind the bookcases on the West wall, we found evidence that this wall had the original back door of Rest Cottage. The current kitchen was added sometime after the house was built – the original kitchen was in a lean-to on the south side of the House. Mica paper of one pattern on the first floor frieze (area between the picture railing and the ceiling). In the 1890’s, this paper would have been used with actual mica mineral to reflect more light in these dark areas. The mica paper was custom reproduced, although today metallic inks are used. When Willard House staff took down a ca. 1970 ceiling fixture on the second floor, we found a different pattern mica paper. This paper was also custom reproduced. There were no historic photos of the room although we had one from ca. 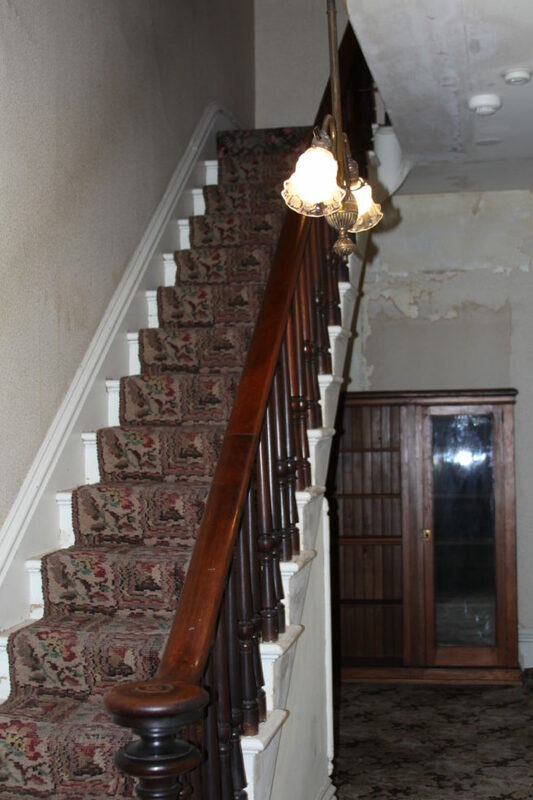 1911 which showed the location of the picture rail which had been removed at some point and how the two wallpapers met on the wall going up the stairway. Since hardwood was expensive, it was infrequently used. 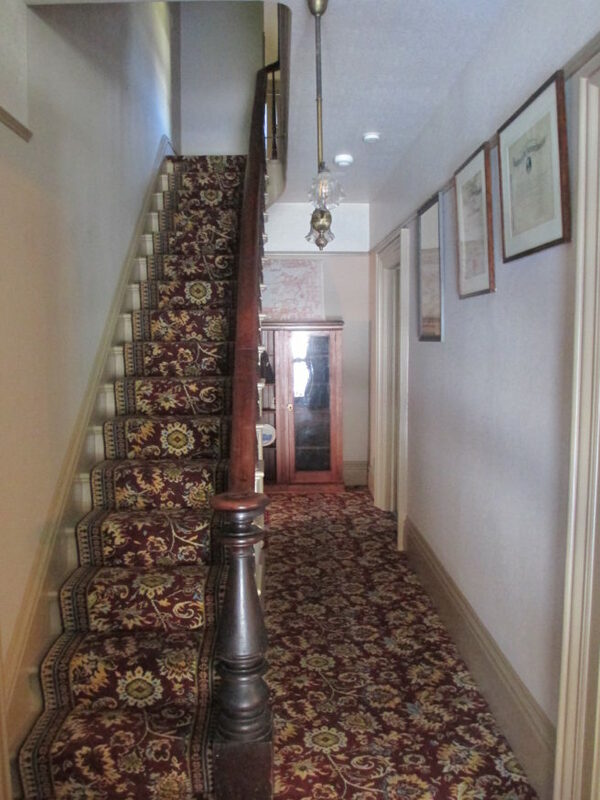 Here in the Entry Hall, they did use a hardwood for the stair railing, intended to impress guests when they entered. Since hardwood was expensive, trim was often a cheap wood that was “grained” to look like an expensive wood – here it was painted to look like oak. 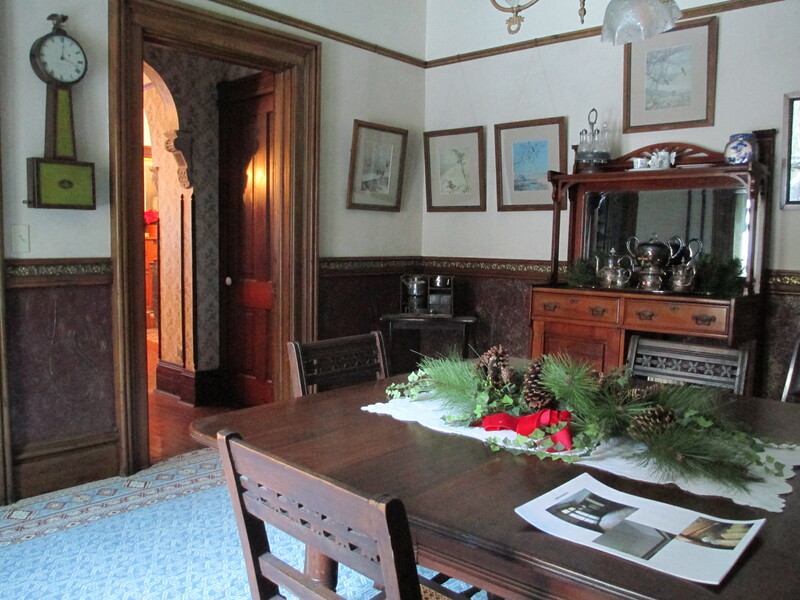 The plaster on the wainscot (area below the chair rail) was a burgundy color with splotches of bronze powder. There were no historic photos of the room. Multiple layers of paint on the trim, as well as gold leaf details with a wash of dark green on the picture rail, which was reproduced by an artisan. No wallpaper from the period of significance on the lower walls, upper walls or ceiling. There were no historic photos of the room so wall finishes and carpet are an interpretation of what might have been here at the time. We surmised Frances and Mother Willard suggested Anna Gordon select the finishes for her office due to the trim color in this room being so different than the other rooms.